The Carlisle Turf Trac R/S lawn tractor tire is designed for excellent traction without tearing up the turf. The Carlisle Turf Trac R/S lawn tractor tire has a rounded shoulder and is most commonly found on consumer lawn mowers. The Carlisle Turf Trac R/S Lawn Mower Tire is designed for excellent traction without tearing up the turf. The Carlisle Turf Trac R/S Lawn Mower Tire has a rounded shoulder and is most commonly found on consumer lawn mowers. For the Carlisle Turf Trac R/S Lawn Mower Tires, call or order from our online tire store today! Carlisle manufacturers tires for many of the most popular lawn and garden equipment in use today. Each of these tires is purpose built to fit a terrain, application or machine. Carlisle tire builds lawn tractor tires,wheelbarrow tires and snow removal tires. 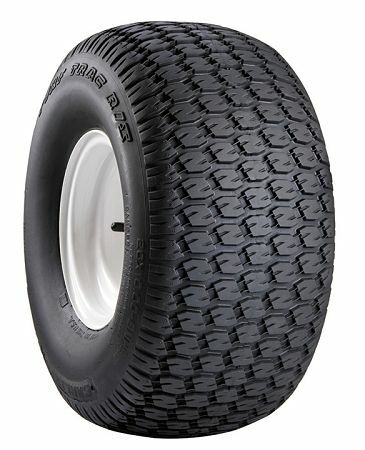 One of the many lawn tractor tires they build is the Carlisle Multi-Trac C/S tire. Carlisle Tire has been building lawn and garden tires for a long time. This allows them to build long lasting high quality tires that are both innovative and reliable. Carlisle Tire was founded in Carlisle, PA by Charles Moomy in 1917. Since 1917 Carlisle Tire has grown to one of the world largest manufacturers of specialty tires and wheels. With over 4000 dedicated employees throughout the world, Carlisle Tire is know the world over for producing high quality tires, tubes and wheel for all kinds of equipment form ATV's to lawn tractors, golf carts and trailers. Carlisle is a large supplier of OE Tires (original equipment) for many of the leading tractor manufacturers and ATV manufacturers. The reason that so many manufacturers pick Carlisle as their tire provider is their commitment to building long lasting tires that are built to perform.